Kyran Hall established his stained glass studio in Manchester in 1982. Designing, manufacturing traditional and contemporary stained glass windows and leaded lights. He uses traditional techniques of painting and firing glass, etching and sandblasting together with kiln formed glass to create beautiful and unique stained glass windows. Work undertaken includes new windows and restorations. His client list includes domestic commissions nationwide; pubs, bars, restaurants, hotels, religious and public buildings including UMIST, Manchester University, Styal Prison and Harrytown Catholic High School. 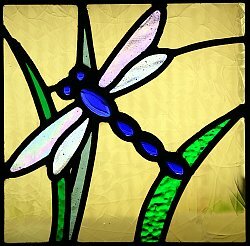 We aim to create, for the client, the very best in decorative stained glass. From the often-muted colours of traditional Victorian stained glass to a vibrantly coloured contemporary design, we strive to enhance your surroundings with a magical ambiance of light and colour. Alongside the windows and decorative panels, we also produce a range of studio glass in the form of glass tiles, tiffany and fused glass lighting and chandeliers, cameo glass, fused glass pictures and a range of dichroic and fused glass jewellery. In 2005 we won 1st prize in the Pearson's glass competition for fused glass with our pixelated portrait of Oliver. We are happy to undertake commissions from a single bespoke item to a large-scale production. Our portfolio includes a large body of domestic and commercial work from private homes, public houses, hotels, restaurants, places of worship, film sets, schools and universities around Britain. Kyran also buys and sells interesting old stained glass and studio glass. The galleries contain a flavour of Kyrans' work and he is able to show you many hundreds more examples at his workshop. Please phone or email to arrange a visit. Kyran can design individually to your requirements or work to your own design.